A comprehensive review authored by scientists from Switzerland and the United States summarized the existing literature on Bt crops from laboratory and field-based studies. The authors, Jörg Romeis, Steven E. Naranjo, Michael Meissle, and Anthony M. Shelton highlight the contribution of Bt crops to conservation biological control. The paper published in the journal Biological Control reports that Bt crops have been grown on more than 1 billion acres over the last 20+ years, and on 100 million hectares in 2017 alone. A major concern related to this technology is that the proteins could harm non-target organisms, specifically those that provide important ecosystem services such as biological control. However, studies have proven that proteins from Bt crops did not harm natural enemies. Furthermore, Bt crops support the conservation of natural enemies and contribute to more effective biological control of both target and secondary pests and lead to a reduction in insecticide use. The paper concludes that the efficacy of Bt crops in controlling important target pests has been very high. The large-scale adoption of Bt crops in some parts of the world has led to area-wide suppressions of target pest populations that benefited both the farmers that adopted the technology and those that did not. For more details, read the paper in Biological Control. Newly-released brand Ethos Chocolate has a line-up of irresistible chocolates that proudly bears a pro-GMO label. The brand boasts of its new label and aims to promote GMO farming as a sustainable solution to save the cacao tree, which scientists predict will be extinct as early as 2030 due to climate change and plant disease. Ethos Chocolate is produced by SPAGnVOLA, a single-estate artisanal chocolatiers and family-run cacao farm in the Dominican Republic. They feature four kinds of chocolates, each one representing a fruit associated with a GMO success story. These are: (1) The Optimist, representing the cacao tree and the international initiative to save it through GMO farming; (2) The Survivor, representing the Rainbow Papaya that saved Hawaii's papaya industry in the late ‘90s; (3) The Trendsetter, representing the Arctic Apple© whose breakthrough technology allowed apples to stay appetizing even when sliced or bruised; and (4) The Hero, representing the orange which, like the cacao, is endangered by plant disease. But through research, a new variety is being developed to save the Florida staple fruit through GMO farming. Read more about these enticing chocolates in A Fresh Look and Well and Good. The Earth is now greener than it was two decades ago, according to the satellites of US National Aeronautics and Space Administration (NASA). Data from NASA satellites revealed that China and India are the leading countries in terms of increased greening on lands. This is attributed to the ambitious tree planting programs in China and intensive agricultural planting in both countries. The greening phenomenon was first observed in the mid-1990s by Ranga Myneni of Boston University and colleagues, but they had to confirm if it was caused by human activities. To collect more information, about 20 years of data were gathered by two NASA satellites orbiting the Earth using Moderate Resolution Imaging Spectroradiometer (MODIS) which provides high-resolution data and very accurate information, helping researchers to record what happens on the Earth's vegetation, down to the level of 500 meters, or about 1,600 feet, on the ground. "Taken all together, the greening of the planet over the last two decades represents an increase in leaf area on plants and trees equivalent to the area covered by all the Amazon rainforests. There are now more than two million square miles of extra green leaf area per year, compared to the early 2000s – a 5% increase," NASA reported. Authored by the Coalition for Agriculture Modernization in the Philippines, Inc. (CAMP), SEARCA Biotechnology Information Center's (SEARCA BIC) second policy brief highlights the urgent need for a strong political support for biotechnology and biotech crops as well as streamlined biosafety regulations in the Philippines. The CAMP is a non-government organization composed of volunteers from agriculture, agribusiness, industry, academe, government, professional groups and international organization who contribute their time, expertise and/or resources to champion agriculture modernization in the country. With the country's existing regulatory framework, it takes at least 65 months (almost five and a half years) to complete all requirements for the commercial release of modern biotechnology products. This, along with groups opposing the technologies, pose a challenge to Filipino biotechnology scientists. The policy brief underlines the need to enact a national law that will support and accelerate science-based innovations and technology, reduce time-consuming regulations, and provide an enabling environment for Filipino scientists to produce high-yielding, pest-resistant biotech crops that could survive in different ecosystems throughout the Philippines and support the country's continuously increasing population. Plants belonging to the Brassicaceae family such as cauliflower, broccoli, cabbage, mustard, and Brussels sprout may have different tastes, but they have a common enemy: white rust. One kind of white rust, caused by the pathogen Albugo candida threatens cabbages. Though not actually a fungus, A. candida acts like one and spreads under the right conditions of humidity and temperature, eating up the nutrients of the plants it attacks. A team of researchers from eight European universities and research centers headed by Sainsbury Laboratory in Norwich has identified four genes that are resistant to A. candida. These genes are nucleotide-binding leucine-rich repeat (NLR) immune receptor that was identified using Arabidopsis thaliana. An additional gene was identified that confers resistance to an isolate of A. candida race 9 that infects Brassica oleracea. The paper reports that immunity conferred by NLR genes provides species-wide resistance to the pathogen. For more details, read the paper published in the Proceedings of the National Academy of Sciences. A study found that young adults' attitudes towards GMO food was influenced by their referent individual, their location, and their gender. Published by PLOS One, the study by Stephen Brosig and Miroslava Bavarova had respondents from the Czech Republic, Ukraine, and Russia. Results showed that there is a positive association between the GM food attitudes of young adults and their referent person, particularly their mothers. Results also showed that the said association is stronger in respondents from Russia and the Czech Republic compared to the respondents from Ukraine. Lastly, the association of attitudes between the attitudes of young female adults and their referent persons was found to be stronger than between young male adults and their referent persons. According to the authors, their research has implications and suggests a potential direction for further studies that may use concepts of personal traits, communication patterns, culture, and power relationships to analyze the impact of referent persons to attitude formations. This, in turn, will be useful in determining people's attitudes towards approved GM foods and GM labeling in the future. Read more details of the study in PLOS One. Rothamsted Research has sought permission from Department for Environment, Food and Rural Affairs (Defra) to run a series of trials using genetically modified (GM) Camelina plants. The application is for a five-year project, ending in 2023, with plants being sown in April, and harvested in September and follows previous GM Camelina trials carried out in 2018 across two sites in Hertfordshire and Suffolk. The first part of the trial will determine performance in the field, and the seed oil yield, of transgenic Camelina plants that have been engineered to accumulate polyunsaturated fatty acids in their seeds. The second strand of work will look at the performance of Camelina plants whose metabolism has been altered to increase seed oil content. The final part will investigate the performance of Camelina plants engineered to contain less sinapine in their seeds. Sinapine is a bitter-tasting chemical that makes the protein-rich seed meal less palatable as an animal feed. For more details, read the news article in Rothamsted Research. 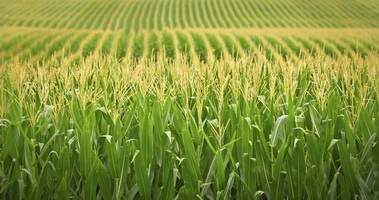 The Netherlands Commission on Genetic Modification (COGEM) was asked to comment on the renewal of the license for import and processing GM maize event, Bt11. Bt11 was approved for import in 1998, which was renewed in 2010 and allowed for a period of 10 years. COGEM released positive comments on both applications. The current application for renewal includes an updated molecular characterization, a recent literature review, and the results of the post-market environmental monitoring conducted since 2009. These additional data do not show any risks of the GM maize event for people and the environment. Thus, COGEM concluded that there is negligible risk in importing and processing Bt11 for people and the environment. Read the advice from COGEM in Dutch. Scientists from All-Russia Research Institute of Agricultural Biotechnology in Moscow reported the first genetically modified einkorn produced. Domesticated einkorn (Triticum monococcum) is one of the oldest cultivated cereal crops globally, and its genetic characteristics (small genome size, low ploidy, high genetic polymorphism) make it a good model for studying the genomics and proteomics of Triticeae. Successful genetic modification of einkorn was achieved using a gene gun. Young tissues of spring einkorn were bombarded with a plasmid containing the reporter gene GFP (green fluorescent protein) and the selectable bar gene (bialaphos resistance gene). Gas pressure, microcarrier size and developmental stage of target tissue were adjusted to attain stable transformation. Results showed that the bombarded einkorn tissues were recalcitrant to regeneration, but certain modifications of the culture medium have been shown to increase the production of transgenic plants. In various experiments, independent transgenic plants were produced at frequencies of up to 0.6%. Molecular analysis, marker gene expression and herbicide treatment demonstrated that gfp/bar genes were stably integrated into the einkorn genome and successfully inherited over several generations. The transgenes, as dominant loci, segregated in both Mendelian and non-Mendelian fashion due to multiple insertions. Fertile homozygous T1-T2 populations of transgenic einkorn that are resistant to herbicides were selected. The results of the study could be a starting point for the application of transgenesis and genome editing and advance comparative functional genomics in einkorn and other cereals. Read more from BMC Biotechnology. Many rice genes involved in the expression of major traits have been reported, however, their superior haplotype combinations for development of ideal variety remains elusive. Thus, Ragavendran Abbai and colleagues at the International Rice Research Institute conducted haplotype analysis of 120 previously characterized genes governing grain yield and grain quality traits in rice utilizing 3K RG panel. The results of their study are published in the Plant Biotechnology Journal. The findings indicated that about 92 of the 120 analyzed genes had haplotypes ranging from 2 to 15, while the remaining 28 genes had only one haplotype in the 3K RG panel. Candidate gene based association study of 120 genes showed that a total 21 of these previously cloned genes were strongly associated with the target grain yield and quality traits. The effect of identified haplotypes for these 21 genes affecting 10 major traits (plant height, number of tillers, days to flowering, panicle length, primary branch numbers per panicle, grain yield, grain size, grain amylose content, grain iron and zinc concentration) were validated in the subset of the 3K RG panel across two crop seasons. The study also revealed superior performance of some of the haplotypes of the studied genes over others. Read more findings in Plant Biotechnology. Monarch butterflies and their principal host plant, the milkweed, have been declining in abundance even before GM crops were planted. This was the result of an extensive study conducted by Jack Boyle, a Mellon Postdoctoral Fellow of Environmental Science and Policy at College of William & Mary. Boyle and team's study is published in the Proceedings of the National Academy of Sciences of the USA (PNAS). The researchers gathered the digital records from museums and herbaria throughout the North America and analyzed the relative abundance of both monarchs and milkweeds for over a century (1900-2016). 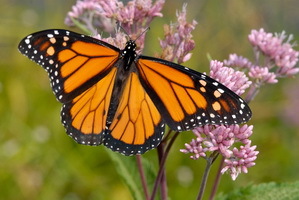 They found that both monarchs and milkweeds were highly abundant in the early 20th century and the recent declines allegedly attributed to herbicide tolerant crops were actually part of a declining trend observed to begin at around 1950. The paper concluded that herbicide resistant crops are clearly not the only culprit, and likely not even the primary culprit. Not only did monarch and milkweed declines begin decades before GM crops were introduced, but other variables, particularly a decline in the number of farms, predict common milkweed trends more strongly over the period studied. Read more from Phys.org and the research article in PNAS. RNA-guided CRISPR-Cas9 system has been regarded as a useful tool in site-directed mutagenesis because of its wide applications in various branches of biology. CRISPR-Cas9 nuclease system displaced the previously used tools and their flaws in site-specific mutagenesis. Thus, this system was used by Piwu Wang of Jilin Agricultural University and team and showed an efficient sequence specific integration/mutation of FAD2–2 gene in soybean. The results of their study was published in BMC Biotechnology. The researchers designed a single guided RNA sequence using bioinformatics tools aimed at targeting specific portions of the FAD2-2 loci in soybean, which is vital in the biosynthesis of peak oil. Findings showed that the soybean transgenic mutants subjected to targeted mutation were detected in the target gene. Furthermore, the detection of Cas9 gene, BAR gene, and NOS terminator were carried out respectively. Further analysess confirmed the stable transformation of Cas9 gene into soybean, as well as the efficient CRISPR-Cas9/sgRNA induced mutation within the target sequence of FAD2–2 loci. FAD2–2 integration at target region in the form of substitution, deletions, and insertions were completed with notably high frequency and rare off-target mutagenesis. The findings provides a summary of recent developments and future challenges in producing agronomically important crops using the CRISPR-Cas9 system. Read the research article from BMC Biotechnology. 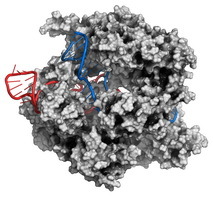 CRISPR is one of the power tools used by molecular biologists in gene-editing. However, the system lacks one important part - a switch. If something goes wrong, there's no switch for shutting it down. Thus, scientists from the University of California, Berkeley worked on improving the system. The researchers used circular permutation and reorganized CRISPR into a programmable tool called ProCas9 which can silently exist within cells until an external factor such as viral infection turns it on. ProCas9 works like an extra layer of security, limiting the editing ability of CRISPR to only a subset of cells to ensure accurate cutting. ProCas9 may also respond to Boolean inputs such as "and" or "not", thus, will only activate when a set of instructions are met. For example, an instruction that says "the cell is infected" leads to a response to "sacrifice the cell", activating CRISPR to cut the genes vital for survival. Read more from Cell and Berkeley News. In a breakthrough research, NRGene, a leading agricultural genomics company based in Israel, and Kayagene, a California-based cannabis breeding company, have announced the completion of the first fully-phased cannabis genome using NRGene's DeNovoMAGIC technology. "We have now only begun to realize the potential in cannabis, as over 99% of its genetic diversity was never studied," said Dr. Gil Ronen, President of NRGene. "Our fully-phased genomes reveal the hidden secrets of diverse cannabis strains and enable us to efficiently implement them for future treatments of multiple human medical conditions," he added. For more details, read the news release from NRGene. The Association for the Advancement of Industrial Crops (AAIC) will hold its 31st Annual Meeting with the theme "Advancing the adoption of industrial crops through innovation and technology." The event takes place on September 8-11, 2019 at the El Conquistador Resort in Tucson, Arizona, USA. The conference will cover research and development activities on breeding, biotechnology, agronomy and utilization of fiber and cellulosic crops, rubber and resin plants, oilseeds, and medicinal and nutraceutical species. This year's AAIC conference will be jointly held with the Sustainable Bioeconomy for Arid Regions (SBAR). For more information please visit the AAIC webpage.